Country in the City!! Spacious and quiet! My two BR, 1500sqft, two bath ranch sits on a half acre adjacent to a large waterfowl reserve right off I-40 / NC-54. Tons of beautiful outdoor living space, screen porch, gas grill, gas logs, large kitchen, Dish network, garage, horseshoe court. 10 minutes to UNC, 15 minutes to Duke, 15 min to RTP. My home for the last ten years, I am renting it out while I take an assignment out of town. Come let me host you at this amazing location. You will love it!! Brand new 4 bedroom, 3.5 bath townhouse with 2 master suites, sleeps 8. Fully equipped kitchen, spacious living room with 75" smart TV. Conveniently located central to the entire triangle -- just 1 mile to Southpoint Mall with upscale and casual dining, shopping, and easy I-40 access. 15 minutes to UNC, Duke, RDU, and RTP, 30 minutes to NC State and downtown Raleigh. Plenty of room for the whole family on three fully furnished floors. 2 king suites with en suite bath, queen bedroom and room with 2 twins share a large hall bath. The open living/dining/kitchen area has plenty of comfortable seating for all and the large dining table seats 8 very easily; family mealtime is together time with everyone around the table. There is a 2 car garage with automatic opener so no need to park on the street; check in is via smart lock with your personal access code and checkout is just as simple with full post visit cleaning service provided. Hardwood floors, granite countertops, ample closet space, and new furnishings and linens make this your home away from home for all ball games, graduations, orientations, campus visits, shopping trips... We can often accommodate early checking/late checkout. Please message me if your require either and I will do my very best. Visiting professors, out of town consultants and others looking for 2 week plus rental, please check with owner for long term rates and to arrange interim cleaning services (if requested). It’s a 2400 sq ft new home 3 bed rooms 2.5 baths , hard wood on main floor, quartz kitchen counters,super shower in the master bedroom that’s downstairs. Beautiful view of the woods. 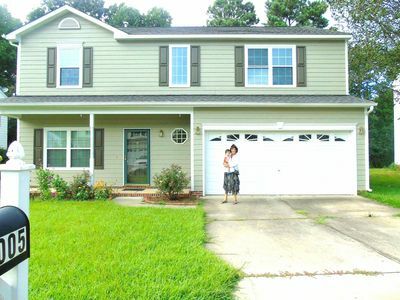 Centrally located close to shopping and highway, close to UNC, Duke 2 car attached garage. Brand new community. The house is being furnished will be ready by feb 3. There will be a quality discount on weekly / monthly bookings. This is a ranch home with 4BR/3BA, very close to SouthPoint Mall and only 5 mins to Jordan Lake - an excellent spot for kayaking, boating or playing water sports. Community access to American Tobacco Trail. Swimming pool to enjoy hot summer days in the water. Gas fireplace in the home with which to seek respite from cool, crisp nights. Every room is very spacious, all guest rooms have smart TVs, and some rooms have desk space for quiet work or contemplation. Unlimited internet is also included. Only 5 miles and 12 minutes form the UNC Dean Smith Center Stadium and 7 miles from the Duke Cameron Stadium, this French artist's home is the perfect place to relax and eat on it's terrace adorned with fountains, flowers, trampoline, swings, fire-pit, outdoor grill Quiet and reclusive, home away from home! So close to UNC, Duke, shopping and dining 5 miles to UNC Dean Smith Center Stadium 6 miles to Duke Cameron Stadium 4 miles to Franklin Street shops and dining 5 miles to The Streets at Southpoint Mall 11 miles to RTP 30 minutes to NC State 20 minutes to RDU Airport This home is very spacious and quiet! It is a 6 bedroom that can accommodate sleeping for 15 people. 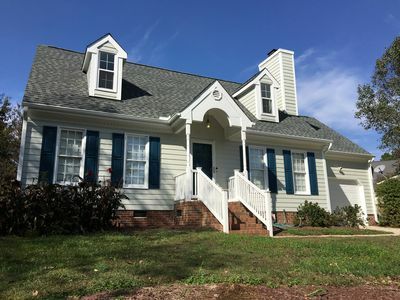 This 2400 sqft, three full bath two story house sits on a half acre right off I-40 /15-501/NC-54. Tons of beautiful outdoor living space, swings, outdoor gas fireplace sitting area, fire pit, porch, terrace, outdoor kitchen with gas grill and trampoline. The well equipped kitchen is very modern . Including a Keurig and Nespresso machine. Kitchen has a dishwasher, fridge and all necessary amenities. The upstairs is the perfect place to relax and enjoy. High-efficiency washer and dryer is located downstairs . 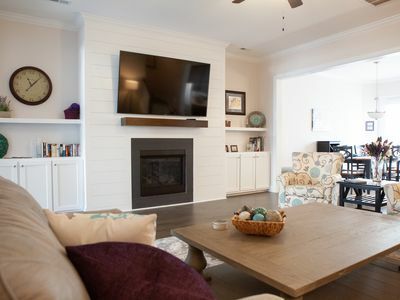 There, enjoy barn doors opening to a large flat screen TV, Wii connected.Take a break from the rest of the household in the yoga room to exercise. The master Bathroom has a jacuzzi tub and walk-in tile shower. The house has 6 Bedrooms: 1 king with private bath 1 queen with private bath 1 queen shared bath 1 twin bed 1 queen shared bath 1 futon/coach that sleeps 2 1 button that sleeps 1 1 coach that sleeps 2 Beautifully decorated and well thought-out design. This home is perfect for quiet families. No huge parties. The outdoor noise must be at low levels. 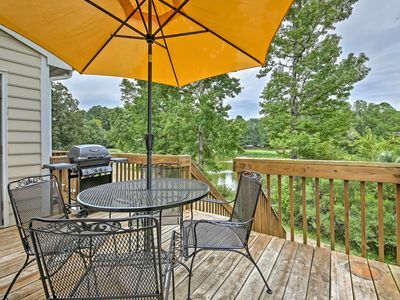 Located in Apex, Chatham county, only 3 minutes to Jordan Lake and 12 minutes to Southpoint mall shopping center. 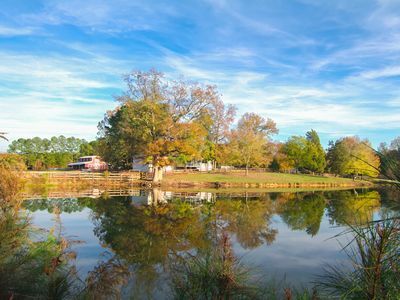 This charming farm offers a beautiful sunset view over a 3 acre stocked pond and 10+ acres of fenced pasture. The high-end manufactured home located on the property allows 12 people to sleep comfortably, and more if needed. Master bedroom has queen size bed, one guest room has another queen size bed, and third bedroom has a full size bed, the fourth bedroom has 2 bunk beds. 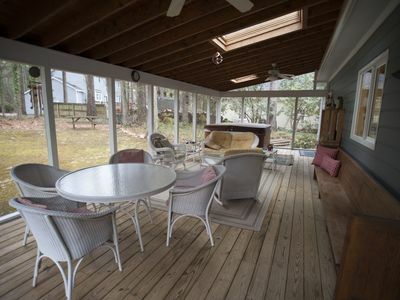 Great screened in porch to enjoy outside living and dining. There are 2 outside fire rings and chairs, a fishing poles waiting for you to fish in a huge pond with brim, crappie and large mouth bass. House has direct tv. Barbecue, horse shoe game, outside swing bench under the pine trees. Your are in a super quiet rural farm 3 minutes from Lake Jordan and within 12 minutes from shopping mall and supermarkets in Apex, #1 place to live according to Forbes magazine. A recent comment from a tenant: All four of us agree that your house is the most unique and wonderful dwelling we've ever stayed in. I can't believe you are so kind to share this special place with strangers. Thank you! Enjoy your morning coffee on the screened porch with a view of boulders and trees while watching the birds at the feeders. 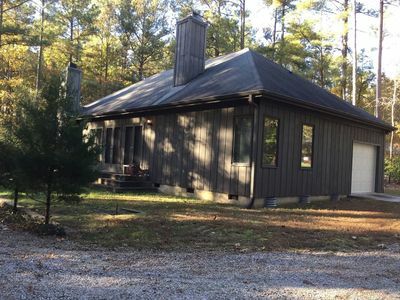 This house is located 7 miles south of Chapel Hill on 5 acres of mature woods with boulders and a stream. It is a custom-designed home with all the fixtures, colors and details chosen by the artistic owner. The steep gables make it look like a 'storybook' house from the outside, while on the the inside they form a high vaulted ceiling making a star shape above the loft. 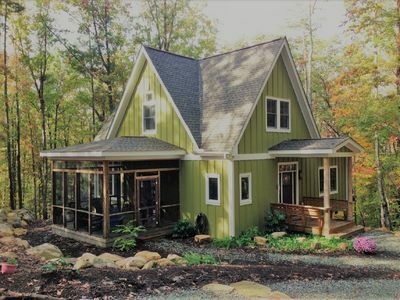 The olive green color makes the house blend in with nature and it looks like it has always been there. The house is Cottage and Arts & Crafts slyle, but also includes Victorian and contemporary elements. Many windows and a large screened porch look out on a private wooded view with many boulders scattered about. The pillars of the front porch are trees that were cut from the land. The main floor consists of an open kitchen/livingroom space with a gas log fireplace. The ceiling of the kitchen and entryway is paneled with oak boards from the trees cut from the site. 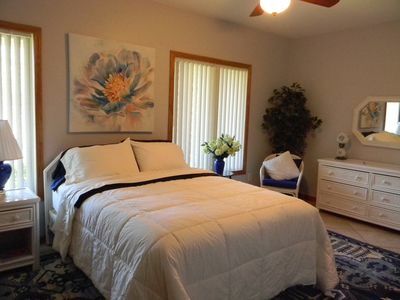 There is a master bedroom with queen size bed and entrance into the shared bathroom. The other bedroom has a day bed with trundle and a desk. The floors are 5 inch Chestnut Oak boards. 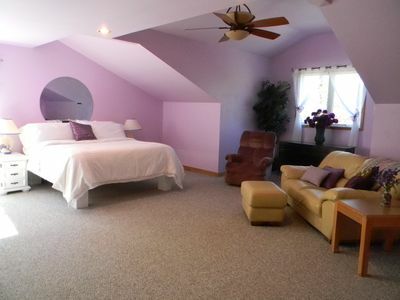 Upstairs is a loft, bathroom and bedroom with queen size bed. In the loft is a built-in desk, WIFI and a wireless printer. Cell phone service is not good, but there is a land line with unlimited long distance. This is a cozy home for those who desire to be away from the hustle and bustle of town. There is central air and heat and ceiling fans in every room. There is a 40' flat screen TV with satellite and a bluray disc player. There is an iPod dock with speakers and radio and a small boom box for playing CD's with radio. There is a lovely stream which forms one border of the property just a few minutes walk from the house, either through the woods or on the road. It is a steep walk, but fine for anyone in shape. There is a flagstone patio which fits into the rocks that surround it, and a campfire area. This home is in a 150 acre community of other homes, each on 5 acres, giving all privacy. The road into the community is gravel and winds up and down on the side of Boothe Hill. The 225 foot driveway is a climb up to the house. This property is totally secluded and peaceful yet only minutes away from shopping and conveniences. Within 2-3 miles are 2 grocery stores, restaurants, pharmacy, liquor store, thrift shop, gas stations, car care and more. In 10 minutes you can be in either Pittsboro or Chapel Hill. Two bedroom one bath gem located just a quarter mile from the Roberson Creek boat access and canoe access. Also just a mile away from the Haw River access. The property's back yard not only boasts a fire pit, pic nic table and tire swing it also butts up to the Carolina Tiger Rescue. The morning and evening growls of a variety of big cats are a common occurrence. The house is made for outdoor living with a large porch where the whole family can gather. Also has a covered front porch with a swing for those rainy afternoons. There is more than enough parking for any and all water toys that one may bring. There is also a path to our family owned pond that is great for relaxing by in one of the swings or for doing some fishing. The inside of the house is made for relaxing, cozy yet spacious. One queen and one full bed make up the bedrooms. There is a large dinning room and kitchen which is filled with any cooking pot, pan, and utensil that you could imagine. Come stay at this hidden gem and let your adventure begin! 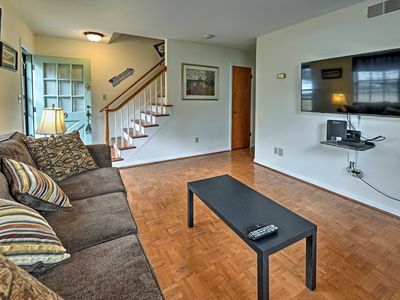 Trail's Edge is a fully furnished and newly updated 1 bedroom, 1 bathroom unit. It has a full kitchen, dining area, living room, and patio as well. The unit is furnished with everything you will need: dishes, pots and pans, towels, sheets, even a washer/dryer. It is located right off one of the beautiful walking trails in the popular Woodcroft neighborhood of Durham. 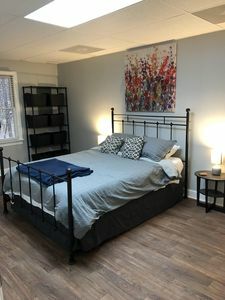 This unit is perfect for someone who is looking for a place to stay for a few weeks or months while visiting Durham for work, school, or an extended family visit. Woodcroft is located in southwest Durham. This part of town has all the amenities any traveler would need within a couple mile radius: the Southpark Mall, several grocery stores, many popular restaurants, a movie theater, etc. The unit is also within 5 miles of UNC-CH, Duke, and RTP. This room is located on the 2nd floor and has a King Bed . Located off route 1, 2 miles off exit 81. We have 3 Private, Beautiful, bedrooms with each having private bathrooms and shower. Each Bedroom is listed separately on HomeAway. 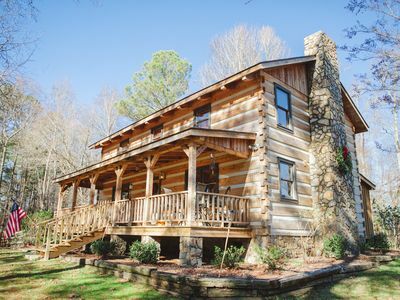 Our home is located a 1/2 mile from Jordan Lake, on 4 1/2 acres of complete serenity. 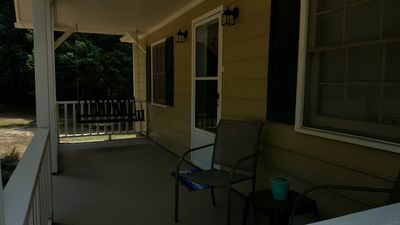 Upon your awakening, you can enjoy a hot, cup of coffee, tea on our large covered front porch, or on comfortable chairs under roof on the back porch. Room with full breakfast included is $150 per night, and breakfast will be served at 9:00am. Enjoy some time relaxing and enjoying our private back yard, listening to the wildlife. We have 2 beautiful, over-loving Boxers that patrol the grounds. Please note: 2 adults per bedroom. Rooms are $150.00 per room which includes a full home cooked breakfast. 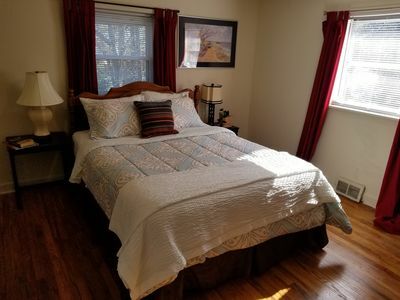 Jordan Lake B & B in Beautiful country setting " Ana Queen Suite"
"Ana Suite" Queen Bedroom with private bath, located on 2nd floor Located off route 1, 2 miles off exit 81. We have a home with 3 spacious, Beautiful, bedrooms with each having their own private bathrooms and shower. Each Room is listed separately on HomeAway. 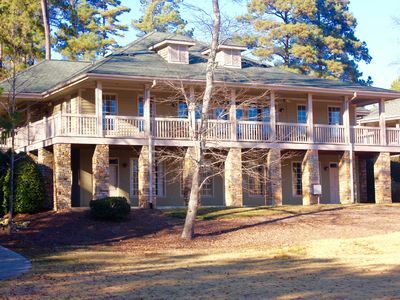 Our home is located 1/2 mile from Jordan Lake, on 4 1/2 acres of complete serenity. Upon your awakening you can enjoy a hot cup of coffee or tea in our large covered front porch or on comfortable chairs under roof on the back porch. Breakfast will be served at 9:00am. Enjoy time relaxing and enjoying our private large back yard. We have 2 beautiful, over-loving boxers that patrol the grounds. Please note: 2 adults per bedroom. Rooms are $150 per room which includes a full home made breakfast. Our home is styled with vintage and antique finds, modern pieces, as well as goods from local shops and small businesses. We offer high speed WIFI, a fully equipped kitchen, laundry room, back porch, fenced in yard, free parking in front of the home, and lots of storage space. Perfect for six people but can accommodate eight. Master Bedroom: Is the largest of the three bedrooms. Furnished with a Calvin Klein queen size four poster bed, a Tuft and Needle mattress, and West Elm bedding; you'll find its pure comfort! There are two closets to hang your clothes and a comfortable chair for lounging. There is also a cozy bathroom stocked with cotton towels, shampoo & conditioner, and body wash. Second Bedroom: This is the smallest of the three bedrooms. While tiny it is also cozy and comfortable. It is furnished with a soft pillow top mattress and high quality West Elm bedding. It also offers a serene view of the backyard and a large closet with plenty of space. Third Bedroom: The third bedroom is towards the front of the house and has a large sunny window that looks out onto the landscaped front yard. There are two twin beds with twin xl Thomasville Fusion memory foam mattresses. One of the beds is a dainty and darling daybed that only needs a cup of tea and a good book. This room also has two large closets to hang your clothes. The living room offers a pull out sofa with space to fit up to two guests. The 49 inch UHD 4K Smart TV in the living room is ready to stream Netflix and broadcasts local channels. You can also access Hulu, Amazon, Vevo, ... etc. on your own personal subscriptions. And if you're here for business or have to catch up on work, there is a desk with a lamp. The dining room is open to the living room and is furnished in a sleek modern table and 6 chairs. A Fully Equipped Kitchen makes cooking a breeze for those nights when you'd rather stay in and watch a movie (popcorn machine included). The kitchen also includes a cozy eat-in nook if you'd rather have the view but stay in the AC. If you do decide to dine outside there is a lovely backyard with a large patio set and small herb garden. Watch the birds and animals by day and star gaze by night. Complimentary fresh organic fairtrade coffee with your choice of french press or Cuisinart coffee/tea maker as well as an assortment of delicious teas. Half and half, sugar, raw sugar, and stevia provided as well. Spacious laundry room with washer and dryer as well as an iron and ironing board. Jordan Lake B & B "Hydrangea Room"
Hydrangea Room: Located on main floor. Queen size bed with private bath. Located off route 1, 2 miles off exit 81. We have 3 Private, Beautiful, bedrooms with each having private bathrooms and shower. Our home is located a 1/2 mile from Jordan Lake, on 4 1/2 acres of complete serenity. Upon your awakening, you can enjoy a hot, cup of coffee, tea on our large covered front porch, or on comfortable chairs under roof on the back porch. Breakfast will be served at 9:00am. Enjoy , time relaxing and enjoying our private back yard. We have 2 beautiful, over-loving Boxers that patrol the grounds. Please note: 2 adults per bedroom. Rooms are $150.00 per room which includes breakfast. Cozy Campus Cottage - Steps to Carolina , Parks and Shopping! The cozy campus cottage is just that! Steps away from UNC-CH Campus but a world away. Perfect for larger groups with 4 bedrooms and an additional air mattress. Also there is a wonderful park and tennis court next door! The cozy cottage is located in the historic Oakwood Community and is perfect for a home away from home. Rooms are generous sizes and the backyard provides a relaxing retreat. Plenty of parking for everyone. Guests can walk to campus, a new playground, tennis court restaurants, and The Fresh Market! Wonderful 3 bedroom home that can host 6 guest comfortably. 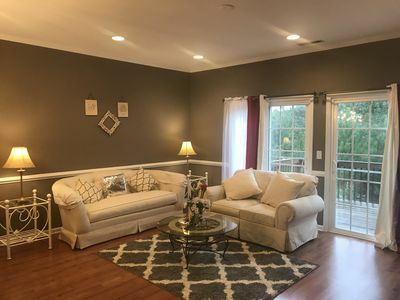 Its located near a nice lake with a path to do your daily wondering and its near We are great 3 bedroom House in excellent Location close to Research Triangle; Southpoint Mall, Tabacco Trail, TP, DUKE University, UNC, RTP, the Airport. We you can walk around the lake every morning and just enjoy having your own home in North Carolina be it for work, visiting . When my husband and I saw this property, we both fell in love with it. Through the years, we remodeled the home completely to provide us the luxuries of country living. We spent many hours sitting on the rocking chairs and gazing at the pond. We loved seeing the geese, heron, deer, turtles and various birds visit us. We enjoyed many evenings in our screened porch, dining, watching movies or just relaxing. You will be amazed at how many stars you can see. Come and stay in our home and experience this haven like serenity. Weekly and monthly discounts available. Some surrounding construction noise is possible. Fully furnished log cabin, family and pet friendly. NEW! Remodeled Pittsboro Farmhouse on 220 Acres! Lakeside Chapel Hill Townhome - Near Duke & UNC! This is a large two bedroom and two bath apartment in the beautiful Flats at 55Twelve apartment community. Our apartment provides all the comforts of home along with the amazing amenities of 55Twelve including a pool for relaxation or fun with the kids, outdoor lounge, and more. 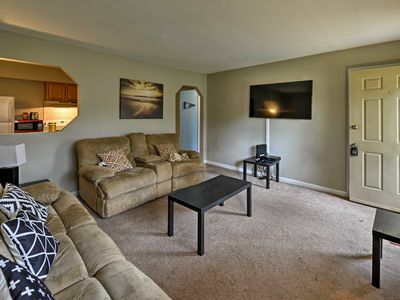 This apartment is a perfect place for a vacationing family, visiting students at Duke, or business travelers that need to be near Duke Medical Center, Chapel Hill or Raleigh. - To ensure the best stay experience we run a simple background check prior to accepting a booking. A short-term renters insurance policy is also created for all guests. There are no additional fees for the background check or insurance policy. 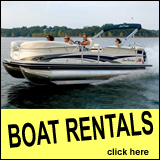 - By booking a reservation, you acknowledge you have read our rental agreement and agree to be bound by its terms. - Charges on your credit card will be billed by ApartmentJet. Your security deposit will be returned approximately 14 days after your departure date, barring any damage claims by the property owner. Chapel Hill Townhome - Minutes from UNC & Duke! We live in a beautiful neighborhood, 5 mins from SouthPoint Mall. Our house is sunny, spacious and well-appointed. The master bedroom has a king bed for 2 or 3 adults or 2 adults and a kid. The guest room has a queen bed for 2. The living room has a sofa-bed or queen bed for 2. The landing area has a queen size air mattress for 2. The toddler room has 1 toddler bed, 1 toddler cot and 1 Queen size air mattress for 2. Malls or walking trails or restaurants or gym or grocery stores are 5-min away. The home is in a diverse, safe and active neighborhood. Located in the RTP area, its close to most IT companies and universities in the area. Overall the home is a little over $1800 sq./ft, with 3 bedrooms and 2.5 bathrooms. The master bedroom with its king bed can be used by 2 adults or 3 adults or 2 adults with 1 or 2 kids. Use the dresser mirror to get ready. Use the walk-in closet to hang your clothes. Use the master bathroom to freshen up. The landing area with a roll-top desk can be used to place a laptop and perform your work while being seated on a revolving, ergonomic computer chair, or everyone can just relax and watch a show on your laptop. 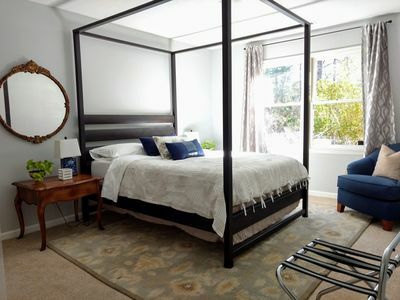 The landing are also features a make-shift room divider for privacy and a Queen-size air mattress for use as an additional bedroom by 2 adults. The living room sofa bed turns into a Queen bed for 2. Use the treadmill for a workout and the coffee table in the living room to keep and sip a hot cup of coffee in the morning. The guest bedroom has a queen bed for 2 adults. The guest bedroom has ceiling light with adjustable brightness, lamps, and blinds to adjust for privacy and light. The guest bedroom also has a reading chair for adults. The Queen bed feels extra comfy with a memory foam mattress. The toddler room has 1 toddler bed and 1 toddler cot, in addition to 1 queen-size air mattress for 2 adults. Common spaces include the kitchen, the dining area, dining room couch and the half bathroom on the 1st floor. Feel free to use the - Washer and dryer to take care of your laundry - Refrigerator to refrigerate your food in our refrigerator - Dishwasher to wash the dishes you use - The stove top, microwave or oven to cook - The dishes/ utensils for eating Feel free to call up or message us and ask us if you need to use any of our food from our freezer, refrigerator or pantry. You can enjoy a lot of time in our 6000 sq. ft fenced in backyard with 4 outdoor chairs for adults, 1 toddler rocking chair, 1 toddler stool, 1 toddler picnic table, 1 toddler playhouse, and 1 toddler slide set for enjoying the beautiful North Carolina weather. There is a large front porch for sipping some tea. On the beautiful tall trees surrounding our backyard, you can spot a variety of birds, squirrels and sometimes racoons. Parking - You can use our drive way to park 2 cars - You can also park an additional car on the curb, by the street, in front of our front lawn (but not with the tires on top of our lawn). Other Information: You are welcome to drop a few things in the fridge or freezer. You can use our cooking top to cook, or else the "cooking" is limited to using the microwave or toaster. We do not have any TVs or Cable, so if you must have TV to fall asleep, you'll have to make do with the internet or your iPod. We have just about everything you might need - toiletries, towels, extra blankets etc. No we don’t have specific things like juicers, hair dryer, iron etc., if you need one, please bring your own :) Interaction We will generally try to stay out of your way. But if you’d like to chat and have a drink together that’s fine, and if you prefer to just nod in our direction if you happen to see us during our stay, that’s also fine. We have a toddler who can sometimes randomly cry, so she can be loud. She might sometimes cry for about 15 minutes before falling asleep. Please note This listing is for a minimum 1 adult and up to 9 more people over 12 years' age, in addition to up to 2 toddlers between age 2 to 4. More than 10 individuals over age 12 (provided 1 of these individuals is an adult), will be charged at the rate of $25 per individual (over age 12) per night. If more than 9 individuals over age 12, and accompanied by an adult need to come stay in the house, then the extra people need to arrange for their own air mattresses or sleeping bags. Furniture must NOT be moved to accommodate any sleeping arrangements. More than 2 toddlers over age 2 and under age 4 will be charged $25 per extra kid per night. More than 15 occupants are not allowed in the house. This house is not kid-safe though you can bring kids if you're thoroughly supervising them at all times and their safety is your responsibility. Parties or Events are NOT allowed in the house. More than 3 cars CANNOT be parked in the premises of our house. We need to be present for your initial check in. We may check your ID. There is no lock box or remote entry. We have a beautiful 2-year-old toddler. Please smile at her if you feel like it but please do not offer her any candies or snacks without permission. We may not have any one specific type of coffee in storage if you need. So, if you want anything specific, please request in advance, and we can check to see if any specific requests can be met. Built on steel piers by noted NC architect, it sits in a secluded family neighborhood among a forest of trees. Three bedrooms, 2 ensuite, 2 with king beds; 3rd bedroom with double bed loft and twin. Lower level is above grade and light filled as well; the great room is furnished with large TV and new full twin bed, memory foam fold-out chairs. Fully-equipped kitchen and safety features for small children. Pac'n'play, baby gates, highchair. Toys of course. A quiet family in-town neighborhood with lots of kids. On a cul-de-sac with a fabulous sledding hill in the event of snow. Walk the Battle Branch Trail (at the end of the block) to campus or to University Mall. Conversely take the bus on Franklin St. Come to settle your freshman, or graduate your senior. Come to watch the TARHEELS do their stuff. Come for your daughter/son's wedding; for the months of a University fellowship, or while you remodel your house; for your alumni gathering or a convention on campus. Stay while you see an event at Memorial Hall. Plan to get your TARHEEL on. Discounted rates by the week and month. Ask about more relaxed rental policies for long term renters. 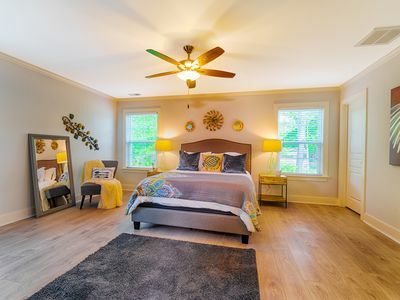 Decorator designed brand new home (2018) conveniently located in quiet neighborhood with many retired people between Duke University and University of Chapel Hill, close to Raleigh-Durham Airport, Research Triangle Park and the SouthPoint Shopping Mall. This home was specifically built to comfortably accommodate up to eight people. All 3 bedrooms are on 2nd floor. Within minutes of downtown Durham where you can enjoy a Durham Bulls baseball game, shop in historic Brightleaf Square, visit the Life and Science Museum or enjoy a cold brew at the numerous microbreweries. Heel House Apartment-Walk to UNC hospital and stadiums! Whether you're coming to Chapel Hill to work, study or play, the Apartment at the Heel House is your perfect getaway. 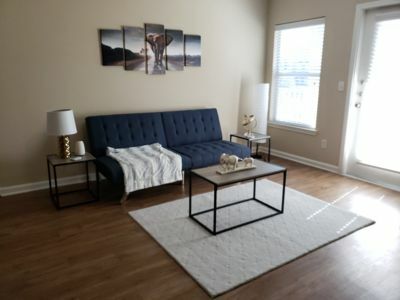 The Dean Dome, Kenan Memorial Stadium, UNC hospital and the UNC Botanical Gardens are an easy walk away .The Heel House Apartment is a light, bright one bedroom unit attached to our home with a private entrance. This newly renovated apartment features new furniture, fresh linens, and a full kitchen. The space can comfortably sleep four and is the perfect spot for a visit to Chapel Hill. We enjoy hosting and want to make your stay as comfortable as possible, so please let us know how we can best accommodate you! 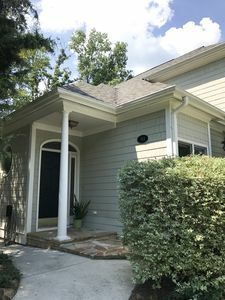 Delightful 2b/2bath townhome perfect for any young professional, graduate student, couple or young family looking for a quiet neighborhood in the Triangle area. We are located conveniently off of Interstate I-40 just 7 minutes from Chapel Hill's historic downtown Franklin Street, 15min from Duke University, 15 min from RTP and RDU international airport, 30min from downtown Raleigh. Our 2-story approximately 2000sqft home comes fully furnished with luxury furniture and modern updates including hardwood floors throughout, cherry kitchen cabinets with solid surface countertops, stainless steel appliances, updated shower and bathroom hardware and countertops, Master suite with Jacuzzi tub and dual walk in closets, and more. Front and back porches are covered. 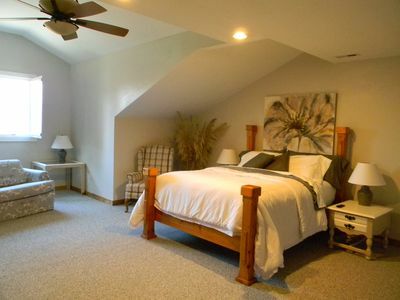 The Master suite is located on the second floor as is the guest bedroom with full bathroom. Another 1/2 bathroom is located on the main level. Open floor plan includes full desk and study nook, living room with gas-log fire place, and dining area. Kitchen is also open with half bar with seating area. The washer and dryer are closeted off the breakfast room.The unit comes with a detached 1 car garage and with available outdoor community parking. The community includes a clubhouse equipped with full-service kitchen, grill, work-out room, study space and outdoor pool. We are open to both short and long term rental agreements with a rate of $1800/mo + utilities. We are a non-smoking unit with a no pet policy. The neighborhood is small, quiet and mostly owner-occupied community. The Carolina- Your UNC 4 Bedroom Retreat! Steps to campus and right on Franklin Street - the Carolina is the perfect retreat to call home while visiting UNC Chapel Hill. The home boasts four bedrooms with four full baths and two living rooms so it works great for larger groups or families. 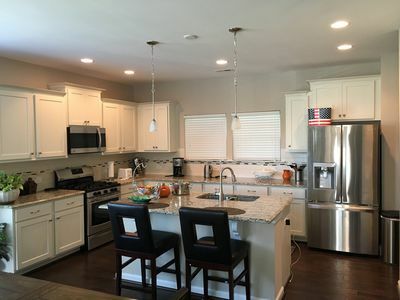 The home was built in 2012 so it is very new with granite and stainless in the kitchen area. Home will be equipped with two flat screened TVs and WiFi access. 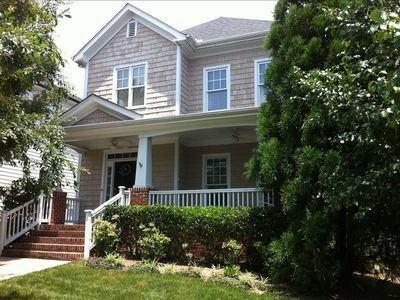 3 Spacious Bedroom-Executive Town House, Brand-New Construction, Duke RTP Area. This townhouse has it all: location, comfort, style and function. Two bedrooms, sleeps four-with one queen bed and two twins (that can be converted into a king) with large closets, and two full bathrooms, one en suite full bathroom in master bedroom and a large guest bathroom. There is also a sleeper sofa in the living room for additional guests. 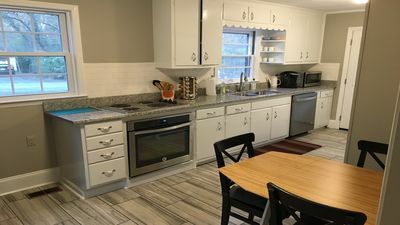 The kitchen is fully equipped with micro-wave, Black and Decker drip coffee pot, toaster, electric kettle, kitchen utensils and knives, stainless steel pots and pans, spices, serving dishes, pantry closet and more. Two TV's with U-verse standard cable, Wifi and a DVD/Blueray player with streaming ablility. Washing machine and dryer, hair dryer, and outdoor patio. 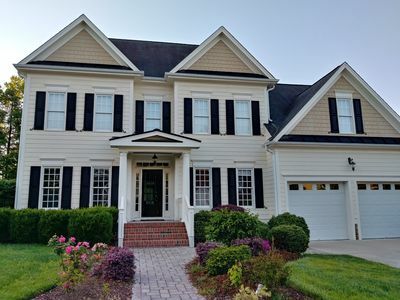 In addition, the location is minutes away from UNC, Trader Joes, Whole Foods, Harris Teeter, Food Lion, several movie theaters, Planet Fitness, Southern Seasons, and more. 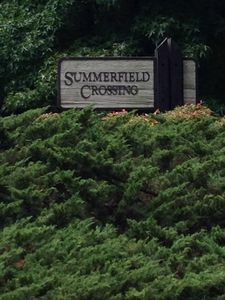 The free Chapel Hill Transit bus runs through Summerfield Crossing and bus service is available and convenient to Duke in Durham. We provide paper towels, toilet paper, coffee filters, luxury sheets and towels, dish detergent, clothes detergent, and bathroom soap (necessities like laundry detergent, soap, dish detergent, and toilet paper are for short term stays only of no more than two weeks). 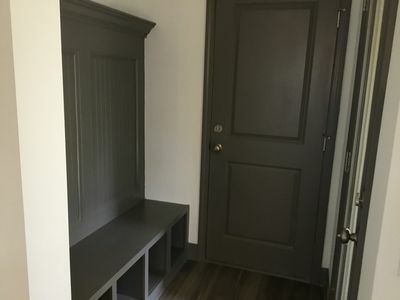 Large double closets in both bedrooms and a coat and linen closet, plus laundry area. Why stay in a hotel when you can enjoy the space and quiet of our home with all the conveniences of your own home? 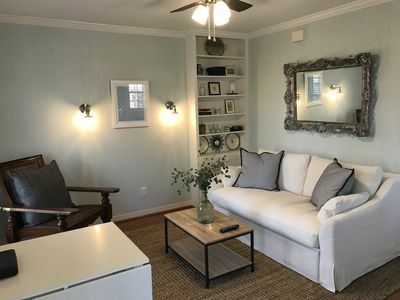 This townhouse is perfect for mature adults as well as families, visiting faculty, families of UNC or Duke students, loved ones with family members in either UNC or Duke medical facilities, or someone who needs a place to call home while researching the area for housing. Please tell us the reason for your stay in Chapel Hill and call us for additional information and for last minute and long term rate discounts. We are offering this house for you and your family or group to use as a tranquil in-town retreat. The six bedrooms and four baths will give you plenty of space to spread out. 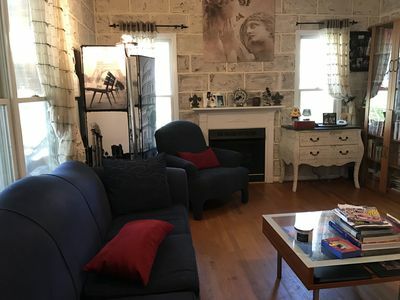 The house is fully furnished and includes Miele and SubZero appliances, supplies in 2 kitchens, quality furniture, office, and four living/family/sitting rooms. Furnished as shown. This classic brick home is lovingly and luxuriously furnished with high end touches like French antiques, Natuzzi sofas, and Pottery Barn beds. The custom chef's kitchen features 16/2 stainless countertops, Miele appliances, and large Subzero 72" refrigerator and freezer. The upstairs features reclaimed rock maple hardwood floors and two large bedrooms with sitting areas. The main floor welcomes you with refinished oak floors, living room with a fireplace, office, open kitchen and dining area, and 3 bedrooms. The ground floor has a large, high-ceiling family room with fireplace and full-wall stocked bookshelves. There is also a 6th bedroom, extra living area and kitchen on this floor. The house is situated on over an acre with a vegetable garden and open backyard area. Original brick walkways wind around to the front door. There is a grill and seating for your outdoor living on the brick patio in the back. 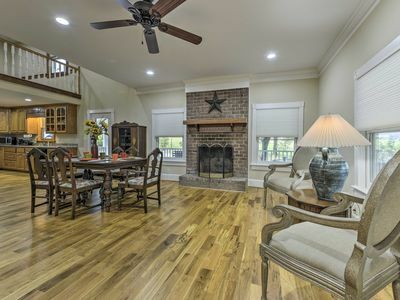 This classic house has been lovingly restored with newly refinished original hardwood floors, original exposed shiplap in the kitchen and bath, new windows, and original wide trim work. The kitchen features new cabinets, farmhouse sink, French door refrigerator, Bosch dishwasher, stainless appliances and cork floor. Bathrooms feature new fixutres with rainfall showerhead. Located conveniently UNC, Duke, I-40, Carrboro, Durham, and RTP, you will have the privacy you want with an easy commute. There is cork flooring in the kitchen, powder room, and third bedroom, and tile in the main bath. Newly insulated walls and replacement windows with gas central heat will keep you warm. Original shiplap is exposed in the kitchen and one of the bathrooms. The shower tub is newly tiled with a rainfall showerhead. Both baths have new vanities and fixtures. The outside comprises an almost an acre lot with a small back deck and front porch for outdoor living space. There's a cafe table on the front porch and dining table on the back deck. Furnished as shown with a queen bed and side tables with a large closet in the front master. The rear master has a queen platform bed with side tables, chair, and dresser. The third bedroom is currently functioning as an office with a pull-out sofa. The kitchen has eating supplies and cooking needs including pots, pans, gadgets, knives, etc. Small appliances include microwave, toaster, blender, food processor, and Keurig coffee machine. Others available on request. This house is perfect for a family get-a-way or an extended family get together. There is enough room for at least 10 people to stay comfortably. There are plenty of seating areas to be social and a great big screened in back porch to enjoy as well. It is on a large wooded corner lot that is private from the neighbors. There is a free city bus that stops a block from the house that goes to all the attractions and shopping areas in Chapel Hill. there is also a walking trail near by that goes right to shopping and restaurants. 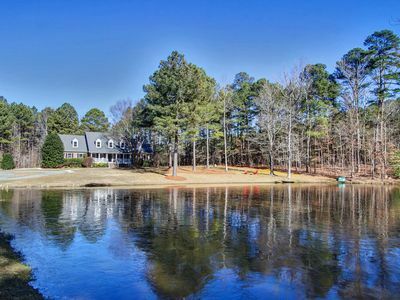 Our home is situated on a lake in the middle of Chapel Hill. Beautiful architectural details. 5 bedrooms 4.5 baths. A 6th bedroom/bath is available if needed (additional fee). Inquire about options. Private dock with kayaks and paddle boards. Private park at the end of our street The house can be rented out by room or the whole house. Great for family reunions, small weddings, rehearsal dinners, graduation, ballgame weekends & girl friend getaways. Large game room with a Pool & Foosball tables. Movie theater to watch your favorite movie, enjoy some popcorn and football game. With a private dock you will able to enjoy drinks and watch the sunset or take the kayaks out and enjoy the lake. 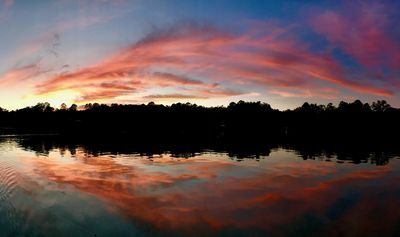 Our unique space is on the only lake in the middle of Chapel Hill NC. 5 minute drive to downtown Chapel Hill or our local University Mall with a brand new dinner theater. 3 min drive to Franklin Street and Whole Foods. Beautiful home with relaxing areas throughout. Reading nooks or desks to get your work done. 2 Bedroom, 2 bath house within walking distance to campus and 100 block of Franklin Street. Interesting gardens and overlooks small stream and wooded area (Shelby's Bottom) Bolin Creek Greenway is easily accessible and leads to parks, shopping and restaurants. Master suite comprises the entire upstairs, 2nd bedroom is on main level. Fully furnished including kitchen ware and linens. Great for sabbaticals, getting to know the town, treading water while remodeling, home shopping or whatever hypotheticals I'm just not coming up with at the moment. Internet, Netflix, utilities included. No cats, don't ask, but if you have a well-behaved dog, we can talk about it. 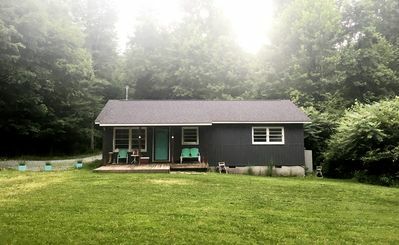 Amazing PRIVATE 2 Bedroom Cabin Close to Downtown! 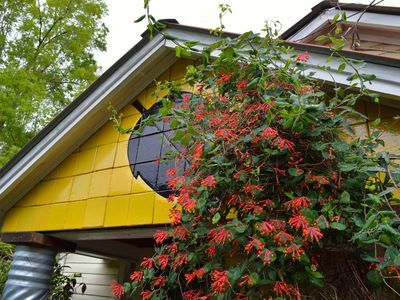 The space: The Scout House is a unique gem – a modern, country hideaway located in a vibrant, cultural community. It's perfect not only for weekend getaways, but also for longer retreats. With all the amenities of a home-away-from-home – including a full kitchen, washer/dryer, large screen TV, books, games, magazines, and a vintage VHS collection – you will be assured of having a comfortable stay. The two bedrooms with brand new beds provide ample space for relaxation and privacy while the tranquil pond will soothe even the weariest of travelers. During the cooler months, guests may enjoy curling up by the wood burning vintage fire place in the living room. Feel free to explore the grounds, but be mindful not to poke around the outbuildings; they're as old as they look (our tobacco barn dates to the late 17- early 1800s!) They're definitely in need of some love and restoration. Guest access: Guests will have access to the entirety of the cabin including a serene sittin' porch with scenic views. The driveway and parking area are offset from the road and completely private. There are several outdoor seating areas, including cozy spots at the fire pit. There is a lightly wooded path to a spring fed pond where swimming, floating, and quiet contemplation are encouraged. Interaction with guests: Since The Scout House is a private cabin our interactions depend on how much you would like to socialize. We love getting to know our guests, but we admire and respect those that prefer solitude as well. We know the area well and would be more than happy to chat about things if you need advice or recommendations. We’ve also left information in the cabin regarding local eats, attractions, upcoming events, and more. We live next door and are readily available should you need us. Occasionally you may see us down in the field tending to our fruit trees, visiting the garden beside the barn, or by the pond, which is behind our house. Otherwise, it's just you and the wildlife! Lastly, it should go without saying, but we are LGBT friendly and nondiscriminatory towards all genders, races, nationalities, ages, and religions! 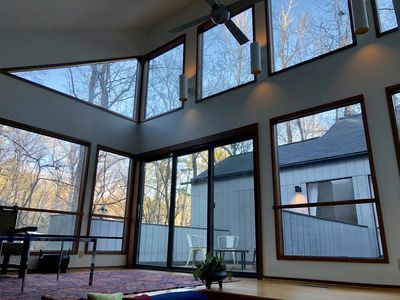 The neighborhood: The Scout House is located on a scenic farm road, but is only a few minutes drive to downtown Carrboro and Franklin St. in Chapel Hill and a mere 7 minute drive to UNC Campus. (Game schedules permitting ;) There's an amazing assortment of places to eat, drink, shop, and generally be entertained. Further, there are year-round farmers markets, parks, and community events that make visiting fun any time of the year. Let us know what you want/need, and we'll point you in the right direction! Getting around: While there are some local public transportation options in addition to taxis, Uber, and Lyft, we recommend you have a vehicle if staying at The Scout House. Other things to note: We love animals, but at this point in time, as we are trying to keep things clean and simple, regretfully cannot accommodate pets. Sorry for any inconvenience this may cause you and your furry sidekicks. Renovated 2800 sq ft. private ranch in neighborhood of mature, large hardwoods. 4 bedrooms, 3 with connected bath/shower. Two rooms with king bed and attached full bath. One queen room with attached full bath. One trundle bed (with two twins) and a shared hall bath. Full kitchen, art room, dining room and living room with stone fireplace and a plasma flat screen tv. 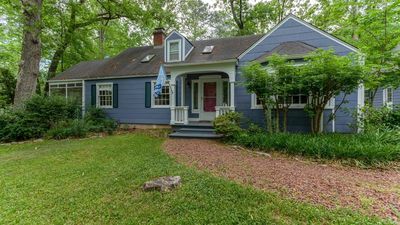 Keywords: Comfortable with character and a wooded private lot in one of Chapel Hill's beautiful older, established neighborhoods. 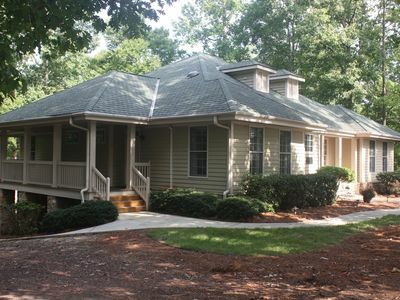 Ideal location less than a mile from downtown Chapel Hill and the University of North Carolina. Easy access to Franklin Street and Main Street in Carrboro. The condo is located in a safe and quiet neighborhood called Columbia Place. Home is completely remodeled, furnished and decorated to create comfortable and relaxing environment for your visit to Chapel Hill. The entire home is on the first floor. Features two bedrooms and large living space with vaulted ceilings. Beautiful skylights allow for natural light. Master Bedroom has a large office and half bath. You will also find a lovely side porch and backyard patio. Towels and clean linens are provided. Kitchen has microwave, stove top, dishwasher and fridge. All the basics including plates, cups, coffee mugs, cutlery, pots and pans to cook meals. Our guests love staying here and you will too! 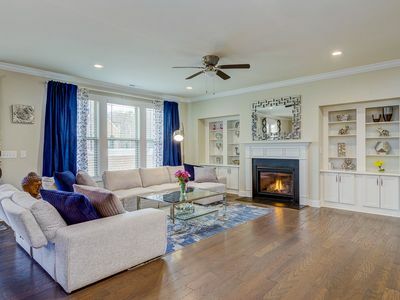 This is a beautifully decorated luxury Model Townhome . 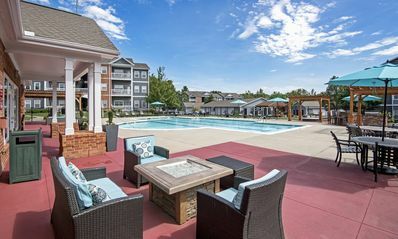 It is located in a quiet, residential community with convenient access to Research Triangle Park (RTP), Raleigh, Duke University (Durham), and UNC Chapel Hill. RDU Airport and all the Restaurants and shopping centers , Park, Kids play area, swimming pool are just minutes away. This spacious ~2000 sqft, 4 bed room and 3.5 bathrooms Townhome can easily host up to 10 people . WELCOME to your home away from home! LOCATION ! LOCATION! LOCATION !!!!!!!!!!! 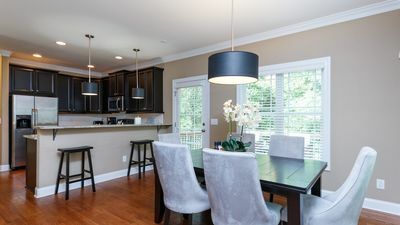 * Shopping centers/Restaurants/Park are just 3-5 minutes away * Within 5 minutes to major Highways I-40/540 * UNC - ~14 miles * DUKE - ~16.5 miles * NC State - ~11.6 miles * RDU - ~6.2 miles * Raleigh downtown - ~16 miles Private backyard for entertainment, relaxing facing woods and creek Your looking for a comfortable place for friends, family, or even a small event at a very great rate to enjoy your stay while either visiting Raleigh/Durham or Chapel Hill. This is the place! HELP AND REQUESTS DURING YOUR STAY: As the owner of this property, I really enjoy hosting every visit and listening and helping guests requests during their stay. I will be quick to respond to any problems or needs during the stay. GETTING AROUND: There is Uber/ Lyft from the airport. CHECK IN: The check in process is very simple. After booking, you will be provided with the code to the smart lock for that visit. The check in will be at 3 p.m. or anytime after. If the cleaners do finish up early, I will notify if early check in is possible along with the new door code. AMENENITIES: All the amenities provided for guests comfort. Such as smart TVs in each room,fast WiFi,coffee, tea, dishes and cups and cooking utensils, pots and pans, extra bed sheets. AIRPORT: It is close to the airport which does entail some low flying airplanes occasionally depending on timing of the year . OUTSIDE: All the restaurants , Shopping centers, mall , Duke ,UNC , RTP are just minutes away.Backyard setting is beautiful facing the woods. INSIDE DETAILS: FIRST FLOOR: Garage, One bedroom with queen size bed and a full bathroom SECOND FLOOR Kitchen, Dinning Area, Great Room,Nook Area, Patio exit, 1/2 bathroom, Washer Dryer Open Kitchen: Gas stove, dishwasher, Fridge, microwave, and coffee maker, toaster and all utensils. Great Room: Open 10 foot ceiling floor with 2 couches, Smart TV, Gas Fireplace which really emits a warm inviting feeling to the home. Dinning Area: This is a more modern setting with a simplistic feeling. Has dark Cherry furniture Patio: Great outdoor View. THIRD FLOOR: 3 bedrooms, 2 bathrooms Bedroom 1: Large very comfortable Master bedroom with King Size bed, Master Bathroom with plenty storage space in the closet , large mirrors, with a smart tv. Bedroom 2: Comfortable size Bred room with Queen size bed with a closet. Bedroom 3 Full Size size bed with computer desk and a chair and a closet Bathrooms - Both the bathrooms re provided with Bodywash/Shampoo and Hair Dryer in the master bathroom. There are wash towels in each bathroom, and many extra towels. Toilet Paper and paper towels will be stocked up in house for your convenience. Thank you for your interest, and please reach out if any further questions or ways I can make your future stay better! 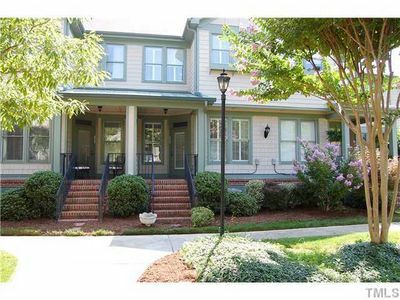 Townhouse in the Trees Steps to UNC-Chapel Hill and Franklin Street! Stay in the heart of Chapel Hill! 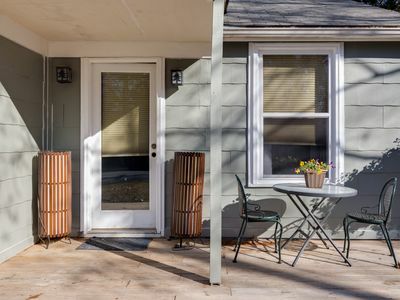 This lovingly-restored bungalow is located just minutes from Franklin Street, Carrboro, UNC's main campus, and the hospital. It’s a short walk to the local YMCA, Umstead Park, the Root Cellar, and Flyleaf books. Want to head out to UNC’s campus or for some fun on Franklin Street? You’re about a mile away, with a nearby bus stop to take you right there. Large wooded lot provides peaceful setting to enjoy your morning coffee or unwind in the evening. The space We renovated this 1940’s cottage with a little love to create a home away from home for you during your stay in Chapel Hill. 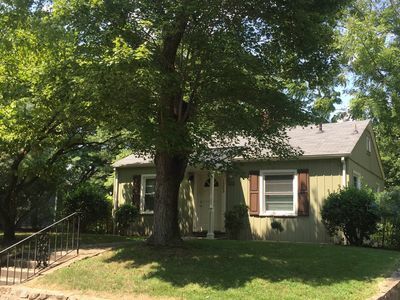 Nestled centrally in the Elkin Hills neighborhood, this 3BR/1 BA home resides on wooded half-acre. Business / Family ready amenities include AT&T Fiber Internet, Roku TV and an infant play pen. The kitchen has most everything you’ll need to cook a meal, and the house is perfect for families, small groups or business travelers. If there’s something you need for your stay, let us know and we’ll do our best to accommodate. Guest access Entire home is yours! Single-story living. Kitchen is fully updated with new stainless steel appliances and the house has both a washer and dryer. There is ample parking both in front and behind house. Interaction with guests You will have complete privacy during your stay, though we live nearby and we’re happy to share tips on how to enjoy the area and some of our favorite spots to eat. We will be available throughout your stay if you need us via cell, email, and text. Located off of Hwy 540 and Hwy 40 minutes away from RDU airport and Research Triangle Park. 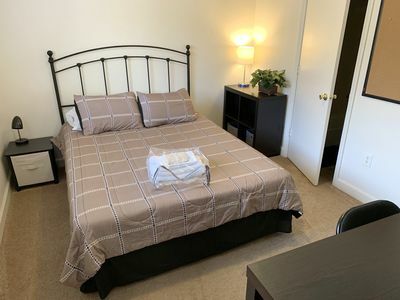 The apartment is nested in a quiet neighborhood to provide a relaxing stay but still only minutes away from downtown Raleigh, Chapel Hill, and Durham. 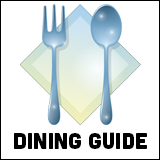 There are multiple shopping centers and restaurants in the surrounding area. We allow guests to drop off luggage before check-in and leave luggage after check-out if needed. Check in/Check out time can be flexible with prior communication. 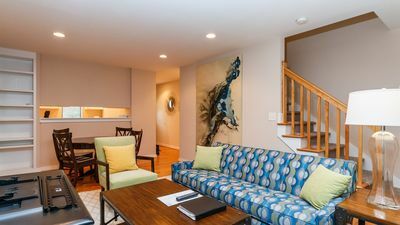 Companies within a 5-mile radius: Biogen, Cisco, Embrex, EMC Corporation, Novan Inc, PPD, IBM, Fujifilm Diosynth, Metabolon, Piper, Becton Dickinson, EPA, Lenovo, etc... Less than 4 miles to RDU airport (roughly an $8 Lyft ride one way) You ll get an entire fully furnished 2 bedrooms and 2 bathrooms apartments. Our listing is equipped with Wifi fast speed internet and we ll also provide all linens, towels, and toiletries. There are plenty of free parking spaces within the community for you and your guests. The bedrooms have Roku TVs with Netflix and Amazon Prime Videos subscriptions. Other channels provided are PlutoTV, Hulu, ESPN Sport, TBS, Comedy Central, The Roku Channel, etc... The bedrooms also have a walk-in closet perfect for guests who are staying long-term. We provide an ironing board, hangers, and iron for your business travel needs. There are 2 private spacious bathrooms equipped with huge garden tubs. WASHER AND DRYER: Guests staying 4 days to one week can use the washer and dryer one time for free. Guest staying more than one week can use the washer and dryer for free once every 7 days. Guests staying less than 4 days can access the laundry room for an extra fee. (Washer, Dryer, washing detergent, dryer sheets) You can freely use the fully equipped kitchen to cook and store food. This includes: fridge, stove, oven, utensils, plates/bowls/cups/pots/pans, spices, and seasonings. We only ask that you clean up after yourself. FULLY FURNISHED ROOM WITH PRIVATE BATHROOM. GREAT FOR UNC SCHOLARS AND VISITORS. WE OFFER THE BEST RATE EXTENDED STAYS. ALL UTILITIES INCLUDED. NO LEASE. Your own bedroom with PRIVATE bathroom in a 4BR/4BA fully furnished top floor apartment. Close to UNC campus on free bus line. Queen-size bed, linen and towels, working table, chair, cube organizer, Roku Smart TV, walk-in closet. 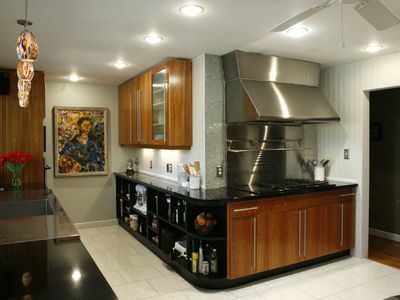 Fully equipped kitchen, utensils. Washer/Dryer in unit. Free WiFi. Pool & grills. MAX. OCCUPANCY IS 1 PERSON PER ROOM. MORE DETAILS: Your own bedroom with private bath in a 4BR/4BA top floor of university community. Clean and modern fully furnished apartment. Large living room and dining room combination. Kitchen with refrigerator, electric range, microwave, dishwasher, cookware and utensils. Utility room with washer and dryer. Nice deck to sit on and enjoy the outdoors with lots of green. Each bedroom has a Queen-size bed, working table, chair, cube organizer, 32" Roku Smart TV, a PRIVATE bathroom and a WALK-IN closet. HOTEL-STYLE CONVENIENCES: Fresh pillows, linen, blankets and towels provided. Complimentary regular housekeeping. Free Spectrum high-speed Internet WiFi. 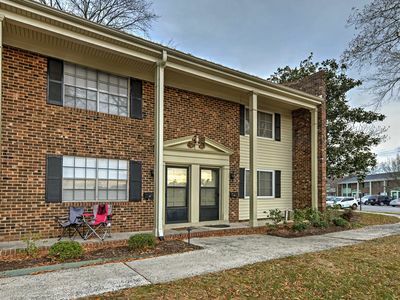 Great location, right on the J & D free bus lines giving quick access to downtown Carrboro, Chapel Hill, and UNC. ONLY 2 MILES FROM UNC CAMPUS. Quick access to Durham, Raleigh, RTP and RDU. Smart home for smart guests: keyless lock, smart smoke/carbon monoxide detectors and alarm monitors, fire sprinkler system protection, smart thermostat, digital notice board, surveillance camera, water leak monitor. -Plenty parking spaces. -No smoking. No pets. -ONE PERSON PER ROOM ONLY as per local occupancy regulation. IF THIS ROOM IS NOT AVAILABLE FOR BOOKING NOW, PLEASE CHECK OUT OUR OTHER SIMILAR LISTINGS.